iOS 5 may include the ability to push over-the-air updates and patches to iOS, meaning you’d be able to update your iPhone or iPad without hooking it to a computer with iTunes. More specifically, iOS 5 is reported to include the feature, but it will be future versions of iOS 5 take advantage of the OTA updating, perhaps as iOS 5.1, according to a report by 9to5mac. Over-the-Air, or OTA, would be an important step to turning the iPhone and iPad into true “post-PC” devices, since it would free the hardware from the tethered world of desktop updates. The next question this poses regards iOS backups that are typically synced with iTunes, but that could theoretically be handled by a cloud based wireless syncing solution which is rumored to appear sometime in the future. The report comes from 9to5mac, who cites “multiple sources” who say that Apple is working specifically with Verizon on the matter. Although they say there is no information on OTA support with other carriers, it would be unlikely for Apple to not pursue a widespread adoption of the feature across all carriers. iOS 5 is expected to make an appearance at WWDC 2011, which begins June 6. This would be a GREAT feature. This is 100% necessary for the POST PC future, I’ve always wondered why do I have to plug my iPad/iPhone into a computer when I first buy it? Why can’t I just use it? And what if you are POST PC and don’t have a PC to update? See what I’m saying? Maybe security updates will download from any connection, and core OS and feature updates will require Wi-Fi? Given that ATT and other carriers will be charging almost exclusively by the MB soon, this will be a FAIL for customers and a WIN for the carriers. …if they allow updating over the cell network. Androids have been doing this for a while, I think it doesn’t count towards data plans so Apple will probably do the same thing. 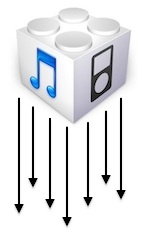 Even if they do put this in iOS5 I imagine at least 60% of users will end up syncing with their computers anyways. Because if something goes wrong mid-update, they’ll end up having to connect it to a computer. That would make it too much of a hassle.